HOLLYWOOD, Calif. (WABC) -- Close races in major categories, and controversy about who is not in the running amped up interest in Sunday's Oscars. One family from the New York area will paid particularly close attention. This, after one of Hollywood's biggest stars played their father in a movie nominated for 'Best Picture'. 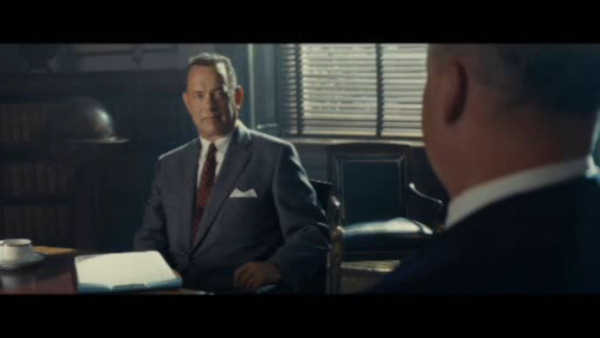 The character Tom Hanks plays was born in the Bronx, and raised his family in Brooklyn, where in the 1950s, at the height of the cold war, the late James Donovan was recruited to defend a Soviet Spy in a courtroom. Entertainment Reporter Sandy Kenyon met his children in the exact place where as shown in 'Bridge of Spies', Donovan sought justice for his Russian client. However, James Donovan died young, forgotten by history, until Hanks brought him back to life. "There were aspects that captured that I thought, 'oh my God, it's Dad - I miss him so much'," said James' daughter, Mary Ellen Fuller. "I could not stop crying. I was so terribly emotional about it. I had no idea that he went through so many challenges. It was very, very painful and difficult," Jan Amorosi added about her father. Steven Spielberg, who directed the film, calls Donovan a 'Hero' for getting a U.S. flier home through a trade he arranged on the 'Bridge of Spies'. Amorosi says she thinks her father would have been pleased about the movie. "First of all, he loved Brooklyn, and the way they portray, or have recreated old Brooklyn is amazing, isn't it?" she says. Amazing enough to score an Oscar nomination as Best Picture from Oscar voters, but somehow, his kids' approval means even more. "I am hard pressed to think of a better movie I have seen in my whole life," John Donovan said. "I thought, 'Dad, I'm so happy for you, now the world is going to know about you. I am so proud and happy for you," Mary Ellen Fuller adds.